Recently we came across an app called Cheaper Dinner which shows you the location of nearby restaurants and bars that offers promotions and discounts when you check into the restaurant through Facebook via the app. As we were rather unfamiliar with the restaurants listed on the App we thought we try one for dinner. 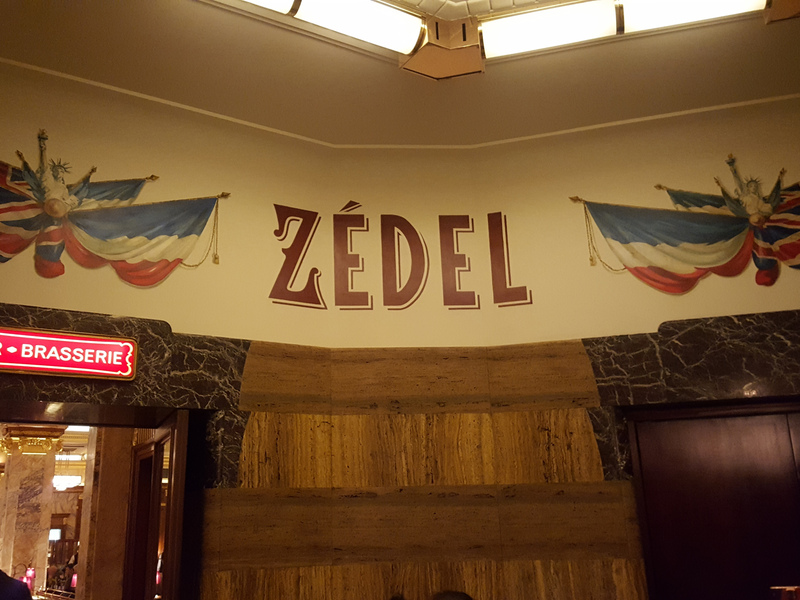 On one fine weekend around Soho, we decided to try out Brasserie Zédel. The brasserie is a grand French beaux art deco restaurant with classic brasserie dishes and choucroutes in 1930s building. Our first impression from the outside we thought it was more of a cafe as we only saw people having drinks with pastries. What we didn’t realise was we had to walk further down past the cafe, down the stars into a glamorous 1920 inspired brasserie. We were meet with please art and decor that defiantly brought the uniqueness out of this place. While waiting for the next available table we sat at the American Bar to have some finger snacks (deep fried prawns) with virgin mojito and passion fruit punch. A side note though, we do urge you to make a reservation few days in advance (especially for weekends) as majority of walk-in customers; including us had to wait for our table almost an hour. To start off our meal this evening, each of us had a leek soup, onion soup, and smoked salmon with French baguette. For our mains, Sofia had a grilled sea bream topped with almond and beansprout, whereas Ayran and Renee had minced steaks with creamy spinach. Despite us being slightly less prepared and not doing any background research of the menu nor the restaurant, we were pleased with everything we had. With reasonable pricing, this is definitely an ideal place to go if you’re planning to have an elegant meal before visiting a theatre in Soho and Piccadilly Circus. Featuring at Zédel is “Live at Zédel” which brings together all art forms in one extraordinary building, featuring music, theatre, comedy and literary events. Menu: The à la carte menu is available from 11.30am until midnight, as are the Prix Fixe menus, starting at £9.75 for 2 courses & £12.75 for 3 courses. Excellent blog you have here but I was wanting to know if you knew of any user discussion forums that cover the same topics discussed in this article?